Two envelopes sent by author Charlotte Brontë to her life-long friend have been sold for £8,100 at auction. 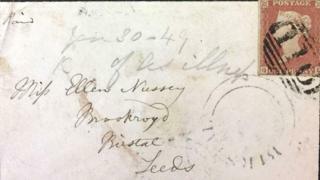 The handwritten envelopes were addressed to Ellen Nussey in Leeds and would have contained letters. Brontë and Ms Nussey met at Roe Head School, near Mirfield, in 1831 aged 14 and 13 and they wrote to each other until the author's death in 1855. The unknown buyers were from "London and the north of England" said auctioneers Henry Aldridge & Son. The pre-auction estimates for each envelope was £800 to £1,200. The other similarly-sized envelope is also written in brown ink with a Penny Red stamp. It is postmarked "Leeds MR 31 1846" on the front and "Bradford and Haworth" on the reverse. A small printed scrap "Attend to Time" on the reverse has been affixed by Brontë.